The Othello/Quintet tunnels remain closed for the season. To ensure a safe visitor experience, qualified geotechnical experts inspect the tunnels and surrounding area prior to the annual opening. Rock scaling is often required. We strive to open the tunnels to the public for the May long weekend, and will update this webpage with adjusted opening dates as required. It contains a 135 hectare land base. It is a popular tourist attraction for the town of Hope and provides viewing, walking, fishing and picnicking opportunities. The hiking trail links to the historic Hope-Nicola Cattle Trail. The engineer Andrew McCullough was an avid reader of Shakespearean literature, and used characters such as Lear, Jessica, Portia, Iago, Romeo & Juliet to name stations of the Coquihalla subdivision. Please note: Services are available from April 1 to October 31. The Othello Tunnels (located within the park) are closed during the winter months due to unstable conditions, falling rocks and ice. Please contact the Park Operator for more information. There is no swimming in this park. The beach area is very rocky and not recommended for use because the river is always unsafe to play and swim in or near. This park is located off Highway #5, north of Hope. Bicycles must keep to roadways. Bicycle helmets are mandatory in British Columbia. Cyclists please dismount and walk through tunnels. Flashlights are strongly recommended for anyone cycling through the tunnels. Anyone fishing or angling in British Columbia must have an appropriate licence. Check the British Columbia Freshwater Fishing Regulations Synopsis for water specific regulations. 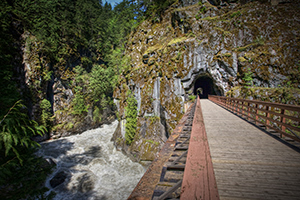 A trail through the Othello Tunnels is an easy 3.5 km round trip. This trail is part of the Trans Canada Trail and features a flat, gravel surface. Flashlights are strongly recommended for anyone walking or cycling through the tunnels. Some are long and dark, and the gravel surface underfoot may be uneven due to erosion caused by dripping water. Pets are allowed on the hiking trail only and must kept on a leash at all times. You are responsible for their behaviour and must dispose of their excrement. Backcountry areas are not suitable for dogs or other pets due to wildlife issues and the potential for problems with bears. There are a few picnic tables available next to the parking lot. Services are available from April 1 to October 31. The Othello Tunnels (located within the park) are closed during the winter months due to unstable conditions, falling rocks and ice. Pit toilets only located near the parking lot and trailhead. There are four wheelchair-accessible toilets near the parking lot. The tunnels trail is also accessible with a flat gravel surface. This gravel becomes uneven through the tunnels, so use caution and a flashlight.